Pull. Flip. Enjoy. More together space! Headaches at kitchen planning when there is just not enough space? We create them for you! PULL. FLIP. ENJOY. More space, more time together. 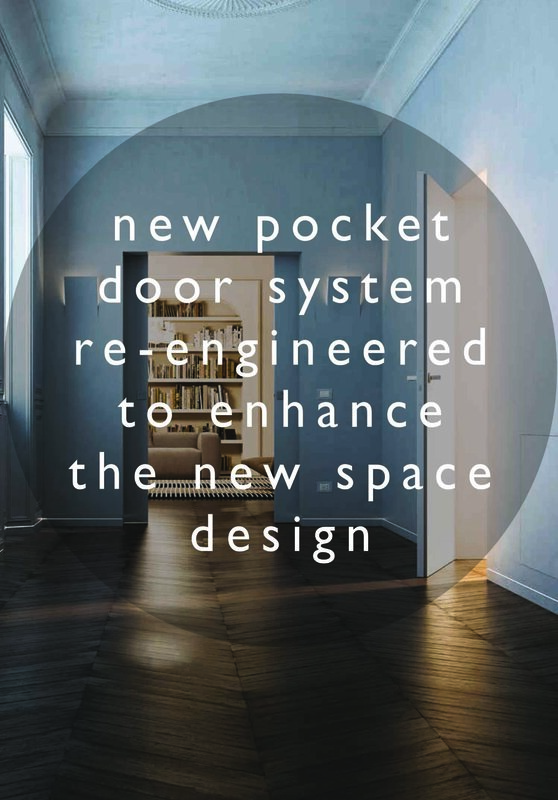 Opening systems for the now new space design without compromising on functionality and easier in space planning. Sliding pocket doors that take up no living space! sliding doors, hinged doors and baseboard. Finally, a concept for designing a space without compromising on functionality, patented technology and aesthetics. ECLISSE SYNTESIS® LINE is the sliding pocket system without jambs and architraves. Thanks to the total integration in the wall and the absence of frames along its perimeter, this system reaches a perfect synthesis between technology and design for a stunning aesthetic result. The pocket system includes elements and technical details that can be pre-rendered or plasterable, allowing the door and the wall to have the same finishing and guaranteeing a perfect camouflage effect. ECLISSE SYNTESIS® LINE BATTENTE is the solution that allows installing a hinged door flushing with the wall, this means a door with no frame: no jambs, no architraves. The doors can be painted in the same colour of the wall, perfectly hiding from the view, and blending in with the rest of the wall. Alternatively, the door panel can be lacquered or decorated with finishing or prints that emphasize them, becoming real design elements. We wish You joy and peace at Christmas and thoughtout the New Year! Livingroom, Kitchen, Bedroom, Bathroom: modular, modern and versatile furnishings that integrate with each other to decorate all areas of the house. New filtering hoods collection by Falmec, which matches perfection, harmony, advanced technologies and a modern, captivating design. Happy New Year and Enjoy Life! Life is short, enjoy the simple things. Keep on top of the latest kitchen design trends straight from Milan! Caesarstone brings you more luxury kitchen design trends fresh from Eurocucina - the biggest kitchen design fair in the world. Do your kitchen design homework without having to set foot outside your house.